Implementation of molecular methods in hop (Humulus lupulus L.) breeding is dependent on the availability of sizeable numbers of polymorphic markers and a comprehensive understanding of genetic variation. However, use of molecular marker technology is limited due to expense, time inefficiency, laborious methodology and dependence on DNA sequence information. Diversity arrays technology (DArT) is a high-throughput cost-effective method for the discovery of large numbers of quality polymorphic markers without reliance on DNA sequence information. This study is the first to utilise DArT for hop genotyping, identifying 730 polymorphic markers from 92 hop accessions. The marker quality was high and similar to the quality of DArT markers previously generated for other species; although percentage polymorphism and polymorphism information content (PIC) were lower than in previous studies deploying other marker systems in hop. Genetic relationships in hop illustrated by DArT in this study coincide with knowledge generated using alternate methods. Several statistical analyses separated the hop accessions into genetically differentiated North American and European groupings, with hybrids between the two groups clearly distinguishable. Levels of genetic diversity were similar in the North American and European groups, but higher in the hybrid group. 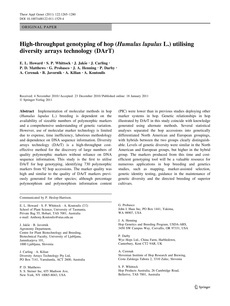 The markers produced from this time and cost-efficient genotyping tool will be a valuable resource for numerous applications in hop breeding and genetics studies, such as mapping, marker-assisted selection, genetic identity testing, guidance in the maintenance of genetic diversity and the directed breeding of superior cultivars.